It’s time to start planning the most important part of the upcoming Labor Day holiday: what you’re going to drink. Labor Day marks the end summer, which means it’s your last chance to get away with fruity cocktails best suited for warm weather, and your last opportunity to hit the neighborhood pool before they shut it down for the year. If you’re in charge of the cookout for the crew this year, or if you’re just looking for something awesome to bring to the festivities, here are a few great Labor Day cocktails that can be easily made (or made pitcher-style) to ensure your party experience is as labor free as possible. Directions: Combine together over ice. Garnish with pineapple chunks on a skewer. This one isn’t exactly a pitcher-style cocktail, but it’s one you can set out the ingredients and just let your guests mix the drink on their own. Directions: Shake and strain Ménage a Trois Citrus and blood orange juice into a rocks glass; top with cold sparkling wine and garnish with an orange twist. Directions: Combine 1 oz. vodka and 1 oz. ginger beer in a pint over ice. Top off with Truly Spiked & Sparkling Colima Lime. Add Lime for garnish. Preparation: Combine all ingredients in a pitcher with ice and stir. Strain into salt-rimmed glasses and serve. 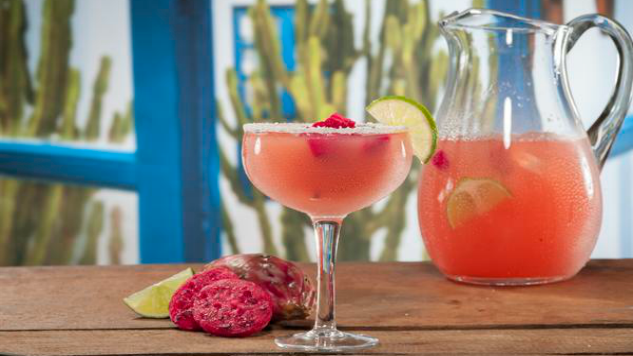 Garnish with prickly pear slice and lime wedge.